It’s been over 15 years since my last visit to Seoul. But one thing never changes: The food. Meat lovers will embrace the BBQ goodness that you can find everywhere in Korea. In particular, check out the restaurant recommendation below. Vegetarian readers, my apologies. I recently zipped over to Seoul, Korea — less than 2 hours flight from Tokyo — to hang with a friend who was there for a week for work. Being a self-admitted cultural Philistine, I didn’t do any sightseeing. I did, however, eat a lot. Hey, food IS culture, right? So what’s on the menu in Korea? Not much that’s good for you, at least not where I went. But plenty that’s good! Although I was Jonesing for BBQ beef, we actually went first to a local BBQ restaurant that seemed interesting. It had some open-air seating which is important for air quality (Koreans LOVE to smoke during dinner), and was full of Koreans — a sure sign that the local food is good. But instead of beef, the only thing on the menu was “Sam Gyeop Sal” — VERY fatty pork that you BBQ yourself, wrap up in some lettuce with some kimchi, and throw down the hatch. Although this cuisine should be served with a complementary angioplasty, it is REALLY good. Sam gyeop sal…Now doesn’t that look good?! That noise? That’s nothing…just my coronary artery exploding. Sam gyeop sal is “three (sam; 삼) layered (gyeop; 겹) flesh (sal;살)”, referring to what appears to be three layers that are visible in the meat. And what do Koreans love to do more than smoke? Drink, of course. Luckily, so do I, and the local beer there, “Cass,” was really tasty with the sam gyeop sal. And if they run out of CASS, show them the photo below and ask for a bottle — It’s one of the cheaper brands of the local rice-based alcohol called “Soju” (소주) — not really “rice wine” as it’s commonly called. It’s more akin to a mix of paint thinner and rocket fuel. Perfect! I liked it enough to drink half a bottle of the stuff. I didn’t dare drink more. But the two Korean girls at the table beside us were taking shots of it as normal as I’d drink a glass of water. Respekt! A bit “hoppy” but goes great with fatty meats! And it’s cheap as could be! I think the brand name reads Jam-i-chil. 1. When your meat is served, it comes with a HUGE pair of scissors. Use those to cut the poor animal carcass into chopstick-friendly size bits. 2. Aside from meat and alcohol, you can get free additional helpings of everything on the table. So if you love kimchi, this is a great place to eat! 3. Koreans decidedly do NOT speak English. So you really get an authentic experience trying to order and get fed in a small local restaurant. Just remember ~~chu-se-yo (Can I have ~~) and kam sa ham ye da (Thank you), and you’ll do fine. I stayed at the Hotel Lake, very close to the Lotte department store. Just behind the hotel was the restaurant below: “Sarang Che” (사랑채) if my memory plus rudimentary Hangul-reading skills are correct. I think it means something like “Restaurant love” or something. Anyway, I went there for lunch. It was my one day alone to eat beef (my friend won’t eat beef…or duck…apparently because her mom doesn’t eat them. Not sure why but I love that logic). I went to the fridge where they have all the cuts on display with prices and went for the top-end one. With one beer it came to about $50. A lot for one person, but…damn! It was crazy delicious! 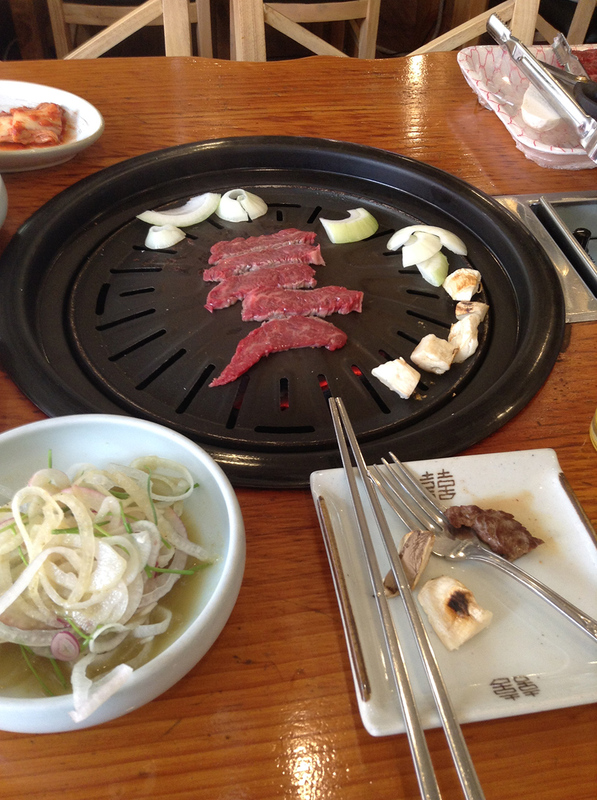 BBQ beef restaurant “Sarang Che” behind Hotel Lake. Not cheap, but hella good! They just bring half a cow on a styrofoam container, you cut it yourself and go to town on it! Note that I have NO idea how I ordered beef beyond pointing. The LOTTE area is very touristy, but the owners of this BBQ beef and pork restaurant really had no idea of the words pork or beef in English. I was lucky that one of the junior waitresses recognized my impersonation of a cow and shouted, “Beef? ?” Bingo! Give that girl a shot of soju! I got refills, sometimes two, for everything you see here. I even ate the entire plate of raw garlic. Helps keeps the vampires away. And for my last lunch, I thought I would try the bi bim bap (비빔밥), which is just a bowl of rice with some veggies, an egg, and a bit of meat if you ask for it. It’s not piping hot and while filling, it definitely lacks the punch of the BBQ beef. On the other hand, you’re less likely to die of jammed arteries eating this stuff, so bring it! Bibimbap: Kinda boring, but filling…and you still get lots of yummy side dishes! 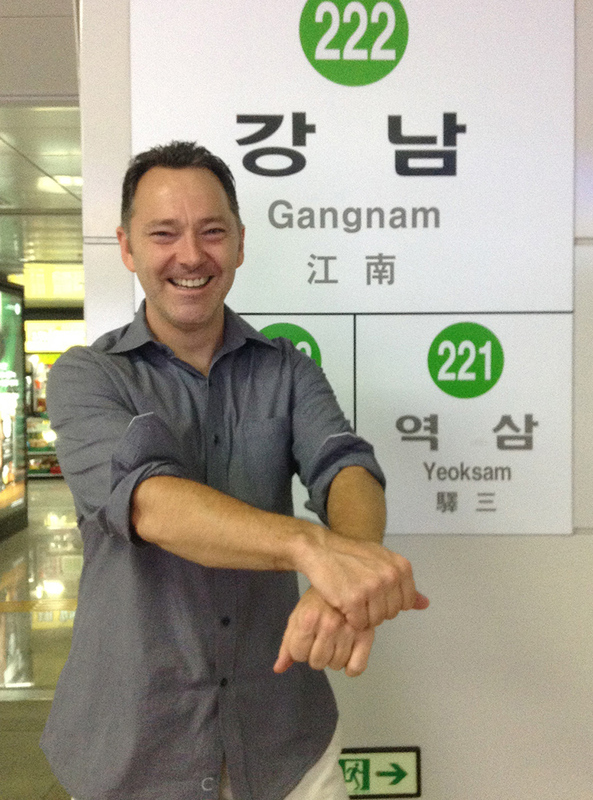 And just to prove I was actually in Korea, I did the buffoon pose in front of the one-hit-wonder’s stompin’ ground sign. Got anything to add that will make my half-baked understanding of Korean food more accurate? Please let me know in the comments section. Kam sa ham ye da! Omigod, you’re killing me here, Mike. I LOVE EATING IN KOREA!!! Agh, I’m totally drooling right now. Dammit. Cafeeeeeeee!!! I’m so happy to hear from you. I miss seeing you around! How are things back on your side of the world? All is going well for you, I hope. And the singing? Still moving forward with the song writing I hope! Yeah, Korea was a good trip. It was just 4 nights but it was great. Next time I’ll stay right in Gungnam, then next time north of the river. Definitely a cool city to explore…and some great food! I’m now back at home in Japan, and I just started another term teaching at the university yesterday. I’ve got a busy schedule this term (as opposed to my 9 hours a week last term. WOW, eh!! lol) so I have my work cut out for me before I can take off again. The next short trip will be to Taiwan…then over to Manila for a few weeks so I can do New Year in Boracay. My first non-Thailand New Years in a decade. When will you get back on the road? Wow. The first time in Europe will be awesome! But there’s so much to see, I think it must be impossible to decide for a short trip…so go for a long trip!! I’m kind of dying to see Hungary. Wanna see some of the really old, old Europe. Haha, I think my ideal vacation length is 3 weeks or maybe 3.5. And spend at least 5 days in each place because it’s so tiring to jump from country to country! Yup, will only get to see a couple other spots in Europe while I’m there most likely. I’ll just have to go back again some other time in the future! 🙂 Really old, old Europe sounds intriguing, I bet it’s beautiful! Hello! I came across your blog and found it really personable and helpful! I am planning a 3 week trip to HK and maybe Thailand in October. Do you buy travel insurance when traveling? I will attempt to blog my journey and looking for blogs to follow as well as increasing my number of followers so feel free to explore and please join my site while you are at it! Thanks for the comment and kind words. I appreciate it! I’ll keep an eye on your blog. Hope you have a good trip. HK is great, but it’s pretty small so you can definitely get over to Thailand in that time. As for travel insurance…usually I don’t get any. But I did this last time when I was in Canada and THailand in August. Can’t remember what company I used, but I got it online for about $100 I think for 5 weeks. I’ll probably start using health insurance more now in SEAsia also as medical costs are really starting to creep up over there. Also, I just tried to post on your blog…and of course it didn’t work. You should consider leaving blogspot and get a profile on WordPress. I used to have this blog on Blogspot but it’s really clunky and hard to network on there. The WordPress ecosystem is a million times better. Something to consider. Yeah, the fatty-meat thing seems to be popular in Korea and Japan…the more marbled fat, the better. But in Korea, you’re basically eating super fat bacon. But it’s hella good. As for veggies, they load you up with pickled stuff like kimchi and kakutegi (not sure how it’s spelled). For more regular veggies, bii-bim-bap has more. Or just spend a few days there, then fly over to Vietnam or Thailand, both of which are awesome for veggies…and fruit, too.